Sit back and hold on tight for a private airboat tour through the Everglades! Choose from a 1-hour, 1.5-hour, or 2-hour ride exploring the "River of Grass". Your guide will be sure to point out wildlife such as birds and reptiles that call this area their home as well as talk about the history, flora and diverse eco-system that lies beneath. 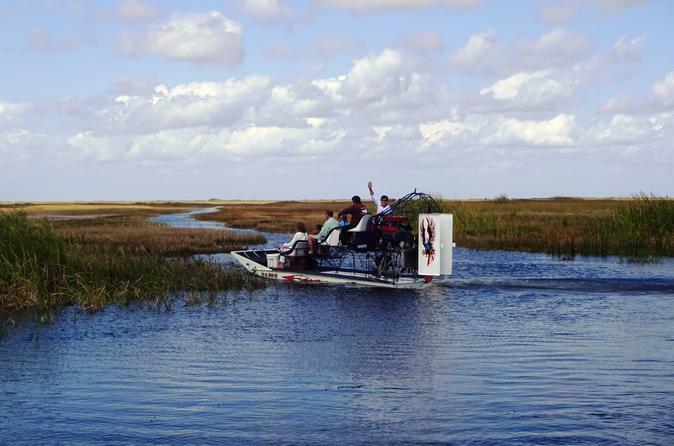 You'll feel like you’re flying through the grass on this private airboat ride of the Everglades. This is the best way to explore the "River of Grass" without causing severe damage to the ecosystem. The Florida Everglades is undisturbed nature that dates back 15,000 years and has breath taking views which span further than the Iguazu Falls. The Everglades vastly preserved ecosystem is 1.5 million acres made up of grasslands and hardwood hammocks. This smooth sliding ride will be the highlight of your trip. Your guide will customize the tour to the interest of your party in addition to telling you remarkable stories and history of the park. You will see beautiful flowers, trees and animal life found no where else in the world. Just outside of Miami lies an uncultivated home of the cold sharp toothed Florida Alligator, which welcomes everyone to their home. So step out of the sand and concrete of Miami and let’s ride and slide in the River of Grass together.